Jon Daly has not ruled out a return to Dundee United, but the striker thinks his future probably lies abroad following his release by Rangers. 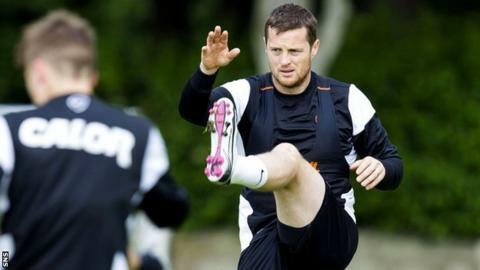 Daly spent two seasons at Ibrox after leaving Tannadice, where he has been training since pre-season. "I would never say never," the 32-year-old said of the possibility of signing for the Scottish Premiership club. "If they came to me and were interested, I would definitely consider it." Daly spent six years at Tannadice and ended as club captain. "I am currently training at Dundee United," he told BBC Scotland. "When pre-season came about and I still hadn't got a club, I rang manager Jackie McNamara and asked if I could go in. "They are a good club with some fantastic young players. "I would never say never, but United would need to want me first." The United States appears to be a possible destination for Daly. "I am probably looking further afield than Scotland," he said. "I'm looking abroad. "At the moment, there are a few clubs interested, but they have their full forum of allocated players so they need to maybe lose one or two of them before they can move. "It is looking like January before the foreign market can come about, so I might need to get something short term until then." Daly had no regrets about his move to Rangers, who helped the Ibrox side win Scotland's third tier before dropping to the bench for much of last season in the Championship. "I was out of contract with Dundee United and at the time they were only prepared to offer a one-year contract," he said. "When I spoke to Ally McCoist, they were prepared to offer two years. "A lot of people say you are dropping down the divisions, which is a fair point, but it is going to a club of Rangers' stature, history, fan base, playing at Ibrox every second week and training at Murray Park every day. "I was just delighted to go to a club like that and play for a man that I really respected in Ally McCoist."